Archives.com has great resources for beginning and advanced family historians alike. For the 150th anniversary of the Civil War, we wanted to point out all of the Civil War related materials available to our users. First are two insightful articles written by expert genealogists, which dive into research strategies for uncovering Civil War era records. The first was written by former law professor and genealogy blogger Craig Manson. In the article, How I Discovered that the First Shot of the Civil War was Fired in Michigan Manson recounts a story from his own family's history, which was central to the beginning of the Civil War. Through the narrative, he also discusses the use of non-typical resources in African-American research like Canadian censuses, Canadian vital records, and local county histories. 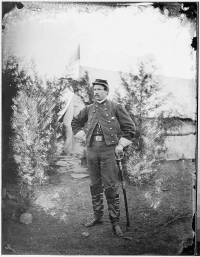 Research Your Civil War Ancestors written by New York based professional genealogist Laura Congleton has many interesting tips for tracing your Civil War ancestors. Laura provides a solid overview regarding how to get started and how to further your research. Read other expert series articles here. Users of our site have access to several Civil War era record collections, holding tons of information about Union and Confederate soldiers. These millions of records may reveal new information about the life of your ancestor, and can often uncover much more than a vital record alone. Military records may include tidbits like year of enlistment, soldier age, unit, and location, to name a few. Civil War collections available on Archives.com include: Civil War Sailor Records, Confederate Soldier Death Records, and Confederate Soldier Service Records. Begin searching military records here. To read more about the records on Archives.com, please visit the Collections page. We are excited to share these valuable resources with users, and look forward to expanding our military record offerings in the future. For the 150th anniversary of the Civil War it is important to take time to remember our ancestors who fought in the conflict, and to write down their stories so we can pass on their legacy!